Clay flowers have become quite popular nowadays because they are non-toxic , non- allergic , eco-friendly and gorgeous .Clay dough is known by different names like lamasa , cold porcelain , Japanese clay , Thai clay and even branded clays available in the market . 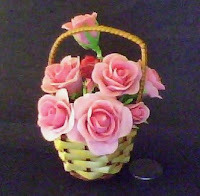 Clay flowers look real as the clay can be made as thin as possible and painted to give natural shading. My peers suggest investing in a Pasta machine , not for making pasta but for thinning clay dough , cutters for making authentic flowers, tools , and of course branded good quality clay . However these pink clay cold porcelain roses are handmade without the any cutters and tools . do visit my blog to have a look at my creations.